All your website visitors are unique. That’s why OptinMonster allows you to show personalized, targeted messages and optins to visitors based on their unique behavior. Today, we’re excited to announce two new targeting rules available to our Pro users that will further help you boost your conversions. These new rules will allow you to increase visitor engagement and capture leads at every stage of the customer journey. Here’s how they work. They say the definition of insanity is doing the same thing over and over again and expecting different results. That can be true for your optins, too! If you’re showing your website visitors the same optin every time they visit your site, it’s going to have diminishing returns with each visit. Now you can use our New vs. Returning Visitor rule to re-engage visitors who’ve already seen your existing optins. New vs. Returning Visitor detects returning visitors who have visited your website before. You can show your loyal audience a different message such as a call to action to like your Facebook page. This new rule takes Onsite Retargeting to the next level. Now you don’t need to hire a programmer to setup cookies. We did the leg work for you. Ad blockers are a growing force on the web today and have huge implications for publishers who earn their revenue via advertising. With our new AdBlock rule, you can target visitors who are using the popular ad blocker software such as AdBlock, AdBlock Plus, and uBlock Origin. You may be surprised how many loyal readers are happy to support you by turning off their ad blocker for your website, if you just ask. We’re the only conversion optimization software that can actually offer this because OptinMonster takes extra effort to ensure that our campaigns cannot be blocked by AdBlock scripts. At the request of our customers, we’ve added a brand new integration with Conversio. Conversio is an all-in-one marketing dashboard for your Shopify store. Now your leads gathered with OptinMonster can be sent emails with Conversio’s easy-to-use email builder. To get started, check out our doc on how to connect OptinMonster with Conversio. MailChimp has just announced a more powerful integration API, v3.0. In order to make sure that this transition does not affect your conversions, we created a brand new MailChimp integration. MailChimp will stop supporting v2.0 of their API at the end of this year, but the API will continue to be operational. Still, this may affect some of your optins. We are asking that you please register the new MailChimp integration and update the affected campaigns, before December 31st, 2016. 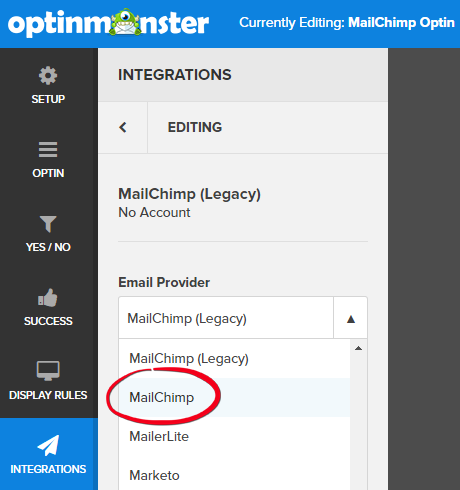 You can find detailed instructions on how to connect OptinMonster with MailChimp here. If you need any help or have any questions, feel free to reach out to our team.